Demography is destiny is an often-repeated phrase when making dire predictions about the impact on society of an aging population. Allegheny County historically has been one of the oldest counties in the nation and demonstrates that demography is not destiny as it continues to be a robust and economically healthy population center. For more than three decades UCSUR has documented the status of older adults in the County along multiple life domains. Every decade we issue a comprehensive report on aging in Allegheny County and this report represents our most recent effort. It documents important shifts in the demographic profile of the population in the last three decades, characterizes the current status of the elderly in multiple life domains, and looks ahead to the future of aging in the County. This report is unique in that we examine not only those aged 65 and older, but also the next generation old persons, the Baby Boomers. 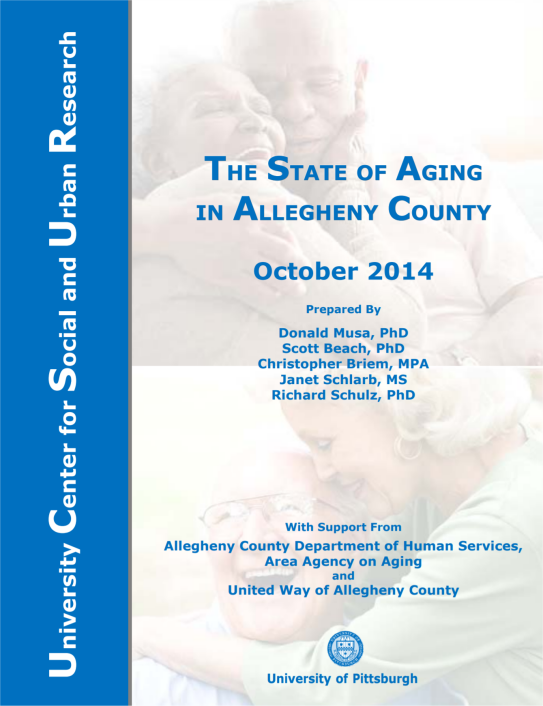 The purpose of this report is to provide a comprehensive analysis of aging in Allegheny County. To this end, we integrate survey data collected from a representative sample of older county residents with secondary data available from Federal, State, and County agencies to characterize older individuals on multiple dimensions, including demographic change and population projections, income, work and retirement, neighborhoods and housing, health, senior service use, transportation, volunteering, happiness and life satisfaction, among others. Since baby boomers represent the future of aging in the County we include data for those aged 55-64 as well as those aged 65 and older. The questionnaire topic areas include work and income, retirement, living arrangements, neighborhood, transportation and mobility/migration, physical, mental and social health, functional status and disability, caregiving, volunteering, and elder service use, and demographics.